This is written using Microsoft SQL Server however a lot of this can carry over just fine to other SQL variants with little change. I am also using SQL Management Studio 2016 when writing this query. This can be found here. Sub queries come handy when you need to return data from multiple tables but need that data Summed up or some form of calculation done on them. This isn’t the only scenario where these are useful but in this example that’s what I will be doing. The example below does not require you to create any tables as everything is done in memory. The “@” tells SQL Server that we are creating a variable and in this case the data type for that variable is a table. IDENTITY(1,1) means that this field auto increments. This is great for Primary keys so you do not have to know what the last ID was, it will do that for you and insert it. Now we want to insert data into these table so we have something to lookup later on. 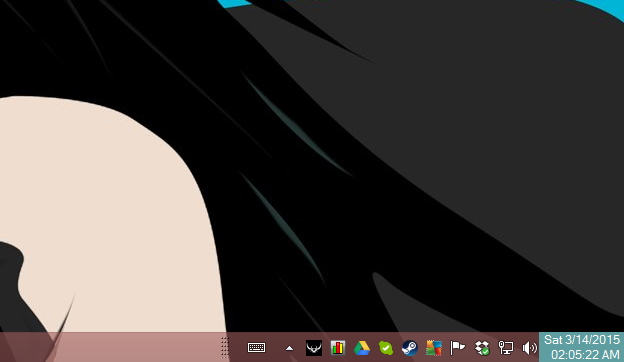 This version of the wallpaper changer is based on my original code that was written in VB.NET. I chose to re-write this program mainly because the original code was horrible and I’ve been wanting to move a lot of my older programs over to C#. The main purpose for this program was to be used in windows XP since this wasn’t a feature that it had. It never really worked in a way that I wanted it to (originally) so this re-write corrects a lot of the issues that the original had. I decided to post it on github with the hopes that someone may find it useful in some way. The code as is isn’t complete. There are some changes I plan on making (currently it just does jpgs) but as the code is , it works. Sys Clock is a simple program I wrote to show the current day of the week, Time, and full date. I came up with the idea for this while playing a game that did not display what time it currently was. Since I played in full screen windowed, an always on top program worked perfectly for this situation. The window for the program can either be locked in place or moved around based on user input. Source Code can be found on my github. While working on some programs dealing with multiple forms, I ran into an issue where I would end up with more than 1 instance of the same form being created. This came up when using a form as an MDI parent and then trying to open another form as a child to the parent form. When the child form would open, you could continue opening new instances of that same form while the one prior was still opened. The code below will check to see if it already exists and if it doesn’t assign the new form as a child to the mdi parent form and open it. //Code that handles Child forms. May be adding more code to this down the road for customization. I wanted to list out some data for a page that wasn’t being pulled from a database but I didn’t want to write out the table and all that. So I dropped a datagridview on to the webpage and wrote some code in the code behind. I will explain this as best as I can. We create two variables, 1 for the Data Table and 1 for the Data Row. When we get into PopulatePCGrid we create a new data set and set up the data table to match the gridview layout. If these fields do not match you will get an error on page load. So make sure the fields you want exist in both the gridview and in the code behind. I wrote a sub proceedure to add rows to the dataTable. This isn’t required but it’s best to break out code that you will be using over and over again and make them into functions /subs. So we call the proceedure and pass in description and data. Data is an object simply because it could be anything. I didn’t want to limit it to a string or integer because that wouldn’t be true (and in fact on the actual page I wrote this for it wasn’t true). I wrote this bit of code in a project that I am working on for taking screenshots and uploading them to a remote server. I am sure there are probably better ways of doing this however this got the job done in a very little amount of code. In order to use this you would need to include the MySql dll into your project and then refer to it. Dim connString As String = "server=server.com;database=db_Name;port=3306;user=db_user;password=db_password"
Dim sql As String = "INSERT INTO db_table(userID,imageHash,notes,lastEditedDate) VALUES(@userID,@imageHash,@imageDescription,NOW())"
This is a piece from my Final fantasy 11 Configurator that I made back when I used to play the game. We’ll now make a registrykey variable. Now we will make sure the location want it stored in that variable. The (“numbers”) is the key name which holds the information that I wanted. Valuekind.dword is just the datatype, you don’t always needs to do this but for this to work for me in this case I had to. Someone was asking how to do multi-threading in the shoutbox and my original example didn’t work because of cross-threads. This basically means I couldn’t set the value of a control within a thread since it’s considered a different process. Well I did manage to get it to work and I figured I’d post the code here. I will also include the source code both both the VB.net and C# versions below. This bit of code will allow you to detect key presses while the form is not the active window. I currently use this for macros and for my trainer programs for turning on cheats. All you need to have is a timer on the form. You can either drag and drop one on the form or declare it in code and write the timer.Tick event. In this example I check for 2 key presses. I have been working on making some trainers for some games and I wanted a basic way of showing that a cheat was enabled. I couldn’t figured out how to draw to the screen so I figured the title bar would be fine. The code above will allow you to set the title window to an external program. Theme: Shapla by Sayful Islam.